Fewer than normal hurricanes are predicted for the Central Pacific this summer and fall, but experts urge the public to be ready with emergency plans and kits nonetheless. Officials from the National Oceanic and Atmospheric Administration predict two to three tropical cyclones this season, June 1 to Nov. 30. Typically, four to five tropical cyclones are forecast for the Central Pacific. Recent data indicates that sea surface temperatures in the Pacific have become cooler than normal, conducive to fewer storms, said Jim Weyman, director of the Central Pacific Hurricane Center. The governor, meanwhile, used the occasion of Hurricane Preparedness Week to sign various disaster relief measures into law. A forecast of a not-too-busy hurricane season came with warnings against complacency yesterday as the governor signed new disaster preparedness legislation. Two to three hurricanes are predicted for the Central Pacific this summer or fall, slightly fewer than an average year. Still, experts said residents should be vigilant and have emergency kits and evacuation plans prepared. "It could mean that one or two would go over the islands," said Jim Weyman, director of the Central Pacific Hurricane Center, part of the National Oceanic and Atmospheric Administration. As part of this week's Hurricane Preparedness Week, officials exhorted the public to get ready for hurricane season, June 1 to Nov. 30. Boding well for the central Pacific is the absence of El Nino conditions, which often bring stronger storms. 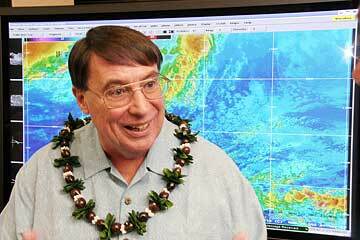 Weyman said that the central Pacific was in an El Nino condition and is gradually moving to a neutral condition, possibly La Nina. He added that since 1995 the number of hurricanes on average has dropped, with the exception of 1997, an El Nino year, marked by warmer sea-surface temperatures in the eastern, tropical Pacific. Publicizing the prediction for fewer hurricanes troubles Weyman, he said, because residents tend to think they do not have to worry. But it takes only one storm to cause tremendous devastation, he said. "And that's the one we need to practice for, and to get those emergency kits and plans ready." 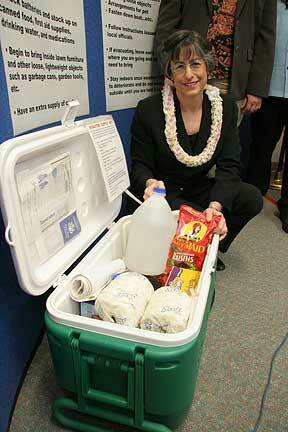 During a news conference at the hurricane center at the University of Hawaii at Manoa, Gov. Linda Lingle signed a bill that appropriated $2 million for a fund to partially reimburse homeowners who invest in wind-resistant improvements. Under the program, called the Loss Mitigation Grant Fund, residents would be eligible to apply for a grant that would reimburse them for 35 percent of the costs incurred for construction of a safe room and other wind-resistant measures, according to a news release. Each home would be reimbursed a maximum of $2,100. The law takes effect July 1. » A measure making it a Class C felony to attack Emergency Medical Services personnel, effective immediately. It complements a law that Lingle signed last year to increase criminal penalties for violence against law enforcement, civil defense personnel, National Guard or active military members who are responding to an emergency. » A measure allowing emergency licenses for out-of-state contractors to help with disaster relief. » Creation of a nine-member state Building Code Council to work with the counties to adopt a statewide building code that includes hurricane-resistant design standards. The law will take effect July 1. As part of disaster preparedness, Lingle said state officials will continue to add more shelter spaces, primarily for senior citizens and those with special needs. She added that there will never be enough shelter space to accommodate everyone should a natural disaster strike, and that it is vital to develop a plan and have an emergency kit ready during Hurricane Preparedness Week.